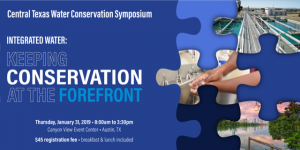 The Central Texas Water Conservation Symposium provides water utilities with the information needed to implement successful water conservation programs, effectively engage customers, and plan for the future. Learn from state and national experts about the latest approaches, what is coming next and best practices for maximum efficiency gains. Read more from Texas Living Waters Project here.